BenCab Museum is located some 30 minutes from the crowded Baguio City. 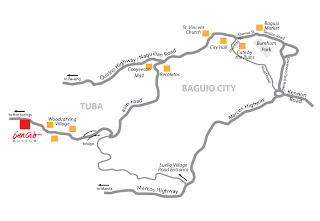 Travel could be a little difficult since it is not found in any of the Baguio maps sold in bookstores. Travel was, however, all worth it! We found the art pieces to be quite engaging, well except for the Erotica and Print Gallery, which were off-limits to children, but was a complete hit to my husband! Seated on this huge trunk bench while admiring Ben-cab's creations. Armed with his own camera - the boy took photos non-stop! This was my favorite... dumb founded to learn it is the sign leading to a common restroom! Cool backdrop for a cool picture shot! Amazing statues and art pieces filled the museum galleries! Love this table... simply unique and one of the kind! Who says museum tours are boring? A visit to BenCab's museum will prove them wrong!!! (1) The museum charges P100 per person, there is student rate, but you need to present your kid's school ID to avail of the discount. (2) While at Bencab's visit and try out Cafe' Sabel (see my related post). It has the most wonderful garden. Food - quiet special!